I am an inveterate lover of diagrams and charts, perhaps because I use similar structures in my art, yet I always enjoy them in theoretical essays, no matter what they are about. Many others as well; indeed, one of the most popular posts here on the Metaphor and Art site was the one with my chart of the History of Composition in art. I will lay the chart out in words. A formal element of art-making (the left-hand yellow oval, Input Space 1 in Fauconnier and Turner’s terms) is seen to be (or appears to be able to be made to be) like an image (the right-hand light blue oval, Input Space 2). This cross-space mapping yields two cognitive spaces: first, the Generic Space in the authors’ terms, above the two ovals, which I have simply titled “Space.” This is an imaginary zone which contains what the two inputs have in common, one’s working space. This is pictured in the diagram with a stage-like curve in green. It is that site wherein the blending becomes possible and useable. Fauconnier and Turner’s charts of cognitive blending suggest an equality of the two inputs which I find especially apt for describing central metaphor in visual art. I have turned their Generic Space Oval into an embracing, stage-like form to better illustrate the way in which this space is the background, amphitheater and world of most artists. It is indeed an arena of sorts for artists, representing their art itself, their medium when particularize, and their life as artists when broadened. Most importantly, mapped onto one another, the two inputs blend to produce the metaphor(m), the green oval at bottom, the Blended Space as Fauconnier and Turner call it. This is the specific trope unique to that creator (and often reveals the reason, or drive behind the initial mapping). This trope, by generalization, is based in the foundational metaphors (the larger, darker blue oval on the right) with which we all think in the culture under question. This self discovery, or self-construction, of a metaphor(m) is delimiting in that not all core metaphors are then applicable, but is also enriching and constructive, as it permits the artist integrated access to all the related foundational tropes (thus the larger size of the blue oval, of which only a section overlaps with the image oval). This metaphor(m) can then be applied to as many aspects of an artist’s process and creations as she desires, or is able to achieve, through extensions and applications of her central trope. This is represented in the chart by the cascading, overlapping ovals emanating out of the metaphor(m) oval. One goal and measure of artistic success is how completely a creator accomplishes a thorough pervasiveness of the central trope throughout the elements of creation: creating many of these offshoot ovals. The entire chain of image-mapping through trope complex to foundational metaphors is exciting to trace in the oeuvre of artists. I do it in this dissertation to several creators, sequencing Lakoffian chains of metaphorical reasoning. From my own experience, I suspect creators in their own thoughts place the weight on the initial creative discernment of seeing a trope in a technical or formal quality, for that is the vision that granted them their individual theatre of possibilities, their future. By and large, this visual and tropaic breakthrough is accomplished by artists in the process of creating works, the so called “happy accident” or “aha”-experience. This circles back on our central thesis, showing the inevitable centrality of embodiment and performative, perceptual experience to innovation. I have painted my way here into a theory, one that is a doorway, though, not a corner. The proof of any hypothesis, nevertheless, is in the testing. This statement has more to do with painting than most people imagine. Artists who have chosen to be makers of objects do so because we are unremitting believers in a world “out there” beyond a simply conceptualized world, one involving our bodies and reality exterior to us. Very few painters are crypto-Descartian dualists in the way that many Conceptualists appear to be, except for rampantly subjectivist Expressionists (who may go as far as solipsism). Those two groups, especially now in Neo-Conceptualism and Neo-Expressionism, have much more in common than they would ever dare admit, both splitting the mind (whether thoughts or emotions) from the body. That is one source of the enmity between the two; they share a philosophy of mind/body split, while esteeming opposed halves and scorning the others. We who are not of those two camps believe one cannot truly think without making. This is a production which is followed by judgment of the creation, both for its internal qualities and in regard to the external experience to which it refers, which instigates alterations and adaptations, that is, additional making — further painting — and so on, until the object appears to be complete enough to be sent out on its own. Hence, one also cannot make without thinking. This is the dialectic of the fabricated object and palpable experience. 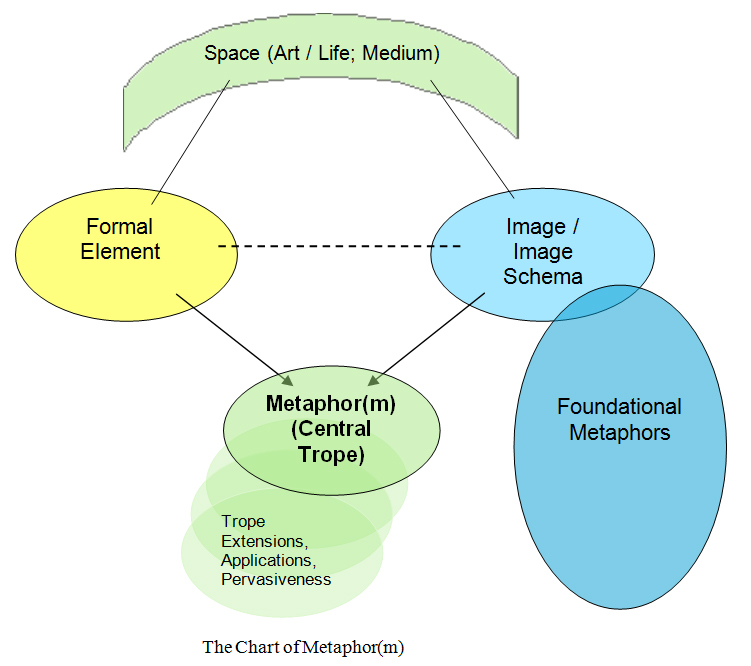 In the future on this site, I will often carry analyses of artists using my notion of metaphor(m)/central trope, and therefore this chart as well. Look for them! This article is based on a section of “Chapter 2, The Theory of Central Trope: Metaphor and Meta-Form” from my dissertation. James Elkins, personal communication: autograph in book, Stories of Art, 2008. Gilles Fauconnier and Mark Turner, The Way We Think: Conceptual Blending and the Mind’s Hidden Complexities (New York: Basic Books, A Perseus Book, 2003. p. 46.